The world’s first wind/current energy generation system is now set to be installed off the coast of Japan, sometime towards the end of the year. The system, capable of producing twice as much energy as a conventional wind turbine, is estimated to be able to generate enough electricity to power around 300 homes. Japan’s NHK News has reported that the system’s wind turbine will be positioned about 47 meters above sea level, and the system’s tidal turbine will possess a diameter of around 15 meters. The expectation is that the system will enter testing sometimes later in the fall. 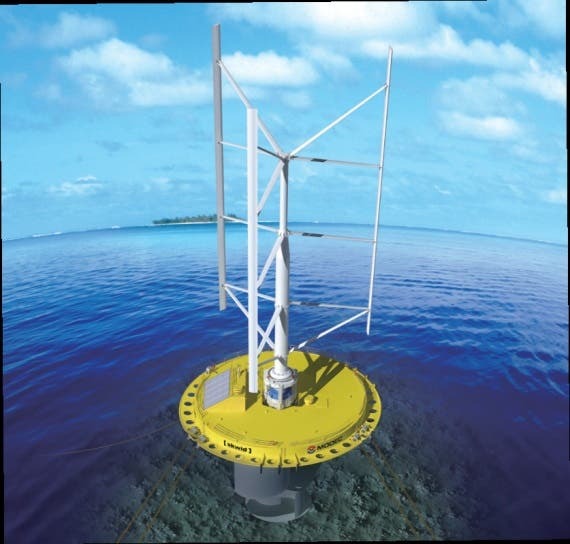 As we reported back in March when MODEC unveiled the design at the Wind Expo 2013 in Tokyo, the floating wind/ocean current power system will be composed of a Darrieus wind turbine and Savonius current turbine. Looks cool — perhaps an effective way to cut down on materials used and improve economic efficiency?